The post–World War II economic expansion, also known as the Golden Age of Capitalism, postwar economic boom, the long boom, was a period of strong economic growth beginning after World War II and ending with the 1973–75 recession. The United States, Soviet Union, Western European and East Asian countries in particular experienced unusually high and sustained growth, together with full employment. Contrary to early predictions, this high growth also included many countries that had been devastated by the war, such as Japan (Japanese post-war economic miracle), West Germany and Austria (Wirtschaftswunder), South Korea (Miracle of the Han River), France (Trente Glorieuses), Italy (Italian economic miracle), and Greece (Greek economic miracle). In academic literature, the period is frequently referred to as the post–World War II economic boom, though this term can refer to much shorter booms in particular markets. It is also known as the Long Boom, though this term is generic and can refer to other periods. The Golden age of Capitalism is a common name for this period in both academic and economics books. The term is also used in other contexts. In older sources and occasionally in contemporary ones, Golden age of Capitalism can refer to the period of the Second Industrial Revolution from approximately 1870 to 1914, which also saw rapid economic expansion. Yet another name for the quarter century following the end of World War II is the Age of Marx, though the Soviet Union's economic statistics were not reliable during this period. Economist Roger Middleton states that economic historians generally agree on 1950 as the start date for the golden age, while Robert Skidelsky states 1951 is the most recognized start date. Both Skidelsky and Middleton have 1973 as the generally recognized end date, though sometimes the golden age is considered to have ended as early as 1970. While this is the global period, specific countries experienced business expansions for different periods; in Taiwan, the Taiwan Miracle lasted into the late 1990s, for instance, while in France the period is referred to as Trente Glorieuses (Glorious 30 [years]) and is considered to extend for the 30-year period from 1945 to 1975. In the United States, unemployment fluctuated during the 1950s, but dropped steadily during the 1960s. OECD members enjoyed real GDP growth averaging over 4% per year in the 1950s, and nearly 5% per year in the 1960s, compared with 3% in the 1970s and 2% in the 1980s. Skidelsky suggests the high global growth during the golden age was especially impressive as during that period Japan was the only major Asian economy enjoying high growth (Taiwan and South Korea at the time being small economies). It was not until later that the world had the exceptional growth of China raising the global average. Skidelsky also reports that inequality was generally decreasing during the golden age, whereas since the Washington Consensus was formed it has been increasing. Globally, the golden age was a time of unusual financial stability, with crises far less frequent and intense than before or after. Martin Wolf reports that between 1945–71 (27 years) the world saw only 38 financial crises, whereas from 1973–97 (24 years) there were 139. Industries that were created or expanded during the post war period included television, commercial aviation and particularly in the US, computer technology. Economists employing Marxian economic analysis and Crisis theory argue that the period of prosperity was a temporary phase in capitalist development fueled by a revival of capital stock, large pools of labor and raw materials, and technological innovation emerging from the end of the Second World War and the scale of defeats of the international working class. This era of prosperity helped prop up the perspective that the crises and business cycles inherent to capitalism could be solved through macroeconomic Keynesian policies, when in actuality the fundamental instabilities of capitalism had not been resolved. Keynesian economists argue that the post war expansion was caused by adoption of Keynesian economic policies. Naomi Klein has argued the high growth enjoyed by Europe and America was the result of Keynesian economic policies and in the case of rapidly rising prosperity that this post war period saw in parts of South America, by the influence of developmentalist economics led by Raúl Prebisch. Another explanation for this period is the theory of the permanent war economy, which suggests that the large spending on the military helped stabilize the global economy; this has also been referred to as "Military Keynesianism". This period also saw financial repression—low nominal interest rates and low or negative real interest rates (nominal rates lower than inflation plus taxation), via government policy—resulting respectively in debt servicing costs being low (low nominal rates) and in liquidation of existing debt (via inflation and taxation). This allowed countries (such as the US and UK) to both deal with their existing government debt level and reduce the level of debt without needing to direct a high portion of government spending to debt service. Real income in the United States by percentile, normalized to 2007 costs. All social classes grew wealthier during the 1950s and 1960s, but the lower percentiles have only seen marginal improvement since then. Much property was destroyed in war. In the inter-war period, the Great Depression also caused investments to lose value. During both World Wars, progressive taxation and capital levies were introduced, with the generally-stated aim of distributing the sacrifices required by the war more evenly. While tax rates dipped between the wars, they did not return to pre-war levels. Top tax rates increased dramatically, in some cases tenfold. This had a significant effect on both income and wealth distributions. Such policies were commonly referred to as the "conscription of income" and "conscription of wealth". The Economist opposed capital levies, but supported "direct taxation heavy enough to amount to rationing of citizens' incomes". Rationing of goods was also widely used, with the aim of distributing scarce resources efficiently. Rationing was widely done with ration stamps, a second currency that entitled the bearer to buy (with regular money) a certain amount of a certain sort of good (for instance, two ounces of meat, or a certain amount of clothing or fuel). Price controls were also used (for instance, the price of restaurant meals was capped). In the post-war period, progressive taxation persisted. Inheritance taxes also had an effect. Rationing in the United Kingdom lasted until 1954. Allied war bonds matured during the post-war years, transferring cash from governments to private households. In Japan, progressive tax rates were imposed during the Allied occupation, at rates that roughly matched those in the United States at that time. High marginal tax rates for the wealthiest 1% were in place throughout Japan's decades of post-war growth South Korea, after the Korean War saw a similar trajectory. Marginal tax rates were high on the rich, until falling quickly in the 1990s. The state also legislated significant land reform, cutting deeply into a landholding elite's power and clientelism. The real oil price was low during the post-war decades, with this ending in the 1973 oil crisis. In the 1940s, the price of oil was about $17, rising to just over $20 during the Korean War (1951–1953). During the Vietnam War (1950s – 1970s) the price of oil slowly declined to under $20. During the Arab oil embargo of 1973—the first oil shock—the price of oil rapidly rose to double in price. Among the causes can be mentioned the rapid normalization of political relations between former Axis powers and the western Allies. After the war, the major powers were determined not to repeat the mistakes of the Great Depression, some of which were ascribed to post–World War I policy errors. The Marshall Plan for the rebuilding of Europe is most credited for reconciliation, though the immediate post-war situations was more complicated. In 1948 the Marshall Plan pumped over $12 billion to rebuild and modernize Western Europe. The European Coal and Steel Community formed the foundation of what was to become the European Union in later years. Institutional economists point to the international institutions established in the post-war period. Structurally, the victorious Allies established the United Nations and the Bretton Woods monetary system, international institutions designed to promote stability. This was achieved through a number of policies, including promoting free trade, instituting the Marshall Plan, and the use of Keynesian economics. The replacement of a "cyclical model" of the economy by a "growth model,"
Replacement of the notion of unemployment as a structural problem by a realization of low aggregate demand. The economies of the United States, Japan, West Germany, France, and Italy did particularly well. Japan and West Germany caught up to and exceeded the GDP of the United Kingdom during these years, even as the UK itself was experiencing the greatest absolute prosperity in its history. In France, this period is often looked back to with nostalgia as the Trente Glorieuses, or "Glorious Thirty", while the economies of West Germany and Austria were characterized by Wirtschaftswunder (economic miracle), and in Italy it is called Miracolo economico (economic miracle). Most developing countries also did well in this period. Belgium experienced a brief but very rapid economic recovery in the aftermath of World War II. The comparatively light damage sustained by Belgium's heavy industry during the German occupation and the Europe-wide need for the country's traditional exports (steel and coal, textiles, and railway infrastructure) meant that Belgium became the first European country to regain its pre-war level of output in 1947. Economic growth in the period was accompanied by low inflation and sharp increases in real living standards. However, lack of capital investment meant that Belgium's heavy industry was ill-equipped to compete with other European industries in the 1950s. This contributed to the start of deindustrialisation in Wallonia and the emergence of regional economic disparities. Between 1947 and 1973, France went through a boom period (5% growth per year on average) dubbed by Jean Fourastié Trente Glorieuses - the title of a book published in 1979. The economic growth occurred mainly due to productivity gains and to an increase in the number of working hours. Indeed, the working population grew very slowly, the "baby boom" being offset by the extension of the time dedicated to study. Productivity gains came from catching up with the United States. In 1950, the average income in France was 55% of that of an American; it reached 80% in 1973. Among the "major" nations, only Japan had faster growth in this era than France. The extended period of transformation and modernization also involved an increasing internationalization of the French economy. France by the 1980s had become a leading world economic power and the world's fourth-largest exporter of manufactured products. It became Europe's largest agricultural producer and exporter, accounting for more than 10 percent of world trade in such goods by the 1980s. The service sector grew rapidly and became the largest sector, generating a large foreign-trade surplus, chiefly from the earnings from tourism. 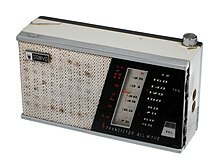 A transistor radio made by Sanyo in 1959. Japan manufactured much of the world's consumer electronics during this period. After 1950 Japan's economy recovered from the war damage and began to boom, with the fastest growth rates in the world. Given a boost by the Korean War, in which it acted as a major supplier to the UN force, Japan's economy embarked on a prolonged period of extremely rapid growth, led by the manufacturing sectors. Japan emerged as a significant power in many economic spheres, including steel working, car manufacturing and the manufacturing of electronics. Japan rapidly caught up with the West in foreign trade, GNP, and general quality of life. The high economic growth and political tranquility of the mid to late 1960s were slowed by the quadrupling of oil prices in 1973. Almost completely dependent on imports for petroleum, Japan experienced its first recession since World War II. Another serious problem was Japan's growing trade surplus, which reached record heights. The United States pressured Japan to remedy the imbalance, demanding that Tokyo raise the value of the yen and open its markets further to facilitate more imports from the United States. In the 1950s the Soviet Union, having reconstructed the ruins left by the war, experienced a decade of prosperous, undisturbed, and rapid economic growth, with significant technological achievements most notably the first earth satellite. The nation ranked in the top 15 most prosperous countries. However, the growth slowed and ended by 1960, as the Khrushchev regime poured resources into large military and space projects, and the civilian sector languished. While every other major nation greatly expanded its service sector, that sector in the Soviet Union (medicine, for example) was given low priority. Following Khrushchev's ouster, and the appointment of a collective leadership led by Leonid Brezhnev and Alexei Kosygin, the economy was revitalised. The economy continued to grow apace during the mid-to-late 1960s, during the Eighth Five-Year Plan. However, economic growth began to falter during the early to mid-1970s, beginning the Era of Stagnation. Sweden emerged almost unharmed from World War II, and experienced tremendous economic growth until the early 1970s, as Social Democratic Prime Minister Tage Erlander held his office from 1946 to 1969. Sweden used to be a country of emigrants until the 1930s, but the demand for labor spurred immigration to Sweden, especially from Finland and countries like Greece, Italy and Yugoslavia. Urbanization was fast, and housing shortage in urban areas was imminent until the Million Programme was launched in the 1960s. The national debt of the United Kingdom was at a record high percentage of the GDP as the war ended, but was largely repaid by 1975. A 1957 speech by UK Prime Minister Harold Macmillan captures what the golden age felt like, even before the brightest years which were to come in the 1960s. Let us be frank about it: most of our people have never had it so good. Go round the country, go to the industrial towns, go to the farms and you will see a state of prosperity such as we have never had in my lifetime – nor indeed in the history of this country. Percentage of British labour force unemployed. In addition to superior economic performance, other social indexes were higher in the golden age; for example the proportion of Britain's population saying they are "very happy" has fallen from 52% in 1957 to just 36% in 2005. The period from the end of World War II to the early 1970s was one of the greatest eras of economic expansion in world history. In the US, Gross Domestic Product increased from $228 billion in 1945 to just under $1.7 trillion in 1975. By 1975, the US economy represented some 35% of the entire world industrial output, and the US economy was over 3 times larger than that of Japan, the next largest economy. $200 billion in war bonds matured, and the G.I. Bill financed a well-educated work force. The middle class swelled, as did GDP and productivity. The US underwent its own golden age of economic growth. This growth was distributed fairly evenly across the economic classes, which some attribute to the strength of labor unions in this period—labor union membership peaked during the 1950s. Much of the growth came from the movement of low-income farm workers into better-paying jobs in the towns and cities—a process largely completed by 1960. Libertarian historian Burton W. Folsom Jr. argues that under the leadership of Senator Walter George, Congress ended most economic controls, cut taxes, slashed spending, and expected entrepreneurs to create the jobs needed for the returning soldiers. The predicted postwar depression never happened and the economy grew rapidly as unemployment stabilized at 3.9 percent. West Germany, under Chancellor Konrad Adenauer and economic minister Ludwig Ehrhard, saw prolonged economic growth beginning in the early 1950s. Journalists dubbed it the Wirtschaftswunder or "Economic Miracle". Industrial production doubled from 1950 to 1957, and gross national product grew at a rate of 9 or 10% per year, providing the engine for economic growth of all of Western Europe. Labor union's support of the new policies, postponed wage increases, minimized strikes, supported technological modernization, and a policy of co-determination (Mitbestimmung), which involved a satisfactory grievance resolution system and required the representation of workers on the boards of large corporations, all contributed to such a prolonged economic growth. The recovery was accelerated by the currency reform of June 1948, US gifts of $1.4 billion Marshall Plan aid, the breaking down of old trade barriers and traditional practices, and the opening of the global market. West Germany gained legitimacy and respect, as it shed the horrible reputation Germany had gained under the Nazis. West Germany played a central role in the creation of European cooperation; it joined NATO in 1955 and was a founding member of the European Economic Community in 1958. The increased free time of adolescents caused the rise of youth subcultures such as Mods. The post-war economic boom had many social, cultural, and political effects (not least of which was the demographic bulge termed the baby boom). Movements and phenomena associated with this period include the height of the Cold War, postmodernism, decolonisation, a marked increase in consumerism, the welfare state, the space race, the Non-Aligned Movement, import substitution, counterculture of the 1960s, opposition to the Vietnam War, the Civil Rights Movement, the sexual revolution, the beginning of second-wave feminism, and a nuclear arms race. 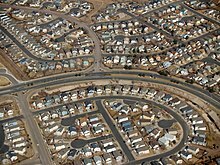 In the United States, the middle-class began a mass migration away from the cities and towards the suburbs. Thus, it can be summed up as a period of prosperity in which most people could enjoy a job for life, a house and a family. In the West, there emerged a near-complete consensus against strong ideology and a belief that technocratic and scientific solutions could be found to most of humanity's problems, a view advanced by US President John F. Kennedy in 1962. This optimism was symbolized through such events as the 1964 New York World's Fair, and Lyndon B. Johnson's Great Society programs, which aimed at eliminating poverty in the United States. The post-war economic boom is often credited by scientists, economists and historians alike as being the tipping point in sending the planet down a path towards worldwide, catastrophic, human-caused environmental collapse, largely through the effects of global warming. The sharp rise in oil prices (due to the 1973 oil crisis) hastened the transition to the post-industrial economy, and a multitude of social problems have since emerged. During the 1970s steel crisis, demand for steel declined, and the Western world faced competition from newly industrialized countries. This was especially harsh for mining and steel districts such as the North American Rust Belt and the West German Ruhr area. ^ Desai, Meghnad (2002). Marx's Revenge: The Resurgence of Capitalism and the Death of Statist Socialism,. Verso. p. 216. ISBN 1-85984-429-4. ^ Ball, Terence; Bellamy, Richard Paul (2002). The Cambridge history of twentieth-century political thought. Cambridge University Press. p. 45. ISBN 1-85984-429-4. ^ Middleton, Roger (2000). The British Economy Since 1945. Palgrave Macmillan. p. 3. ISBN 0-333-68483-4. ^ a b Skidelsky, Robert (2009). Keynes: The Return of the Master. Allen Lane. pp. 116, 126. ISBN 978-1-84614-258-1. ^ Marglin, Stephen A.; Schor, Juliet B. The Golden Age of Capitalism. Clarendon Press. p. 1. Retrieved 2015-12-20. ^ Wolf, Martin (2009). "3". Fixing Global Finance. Yale University Press. p. 31. ^ Bjork, Gordon J. (1999). The Way It Worked and Why It Won't: Structural Change and the Slowdown of U.S. Economic Growth. Westport, CT; London: Praeger. pp. 2, 67. ISBN 0-275-96532-5. ^ Yaffe, David; Bullock, Paul (1979). "Inflation, the Crisis and the Post-War Boom". Revolutionary Communist No. 3/4 (Second Edition), November 1979. Retrieved December 16, 2015. ^ Panitch, Leo; Miliband, Ralph (1992). "The New World Order and the Socialist Agenda". The Socialist Register. Retrieved October 11, 2015. ^ Klein, Naomi (2008). The Shock Doctrine. Penguin. p. 55. ^ Kim, Nak Nyeon and Jongil Kim. 2015. "TOP INCOMES IN KOREA, 1933-2010: EVIDENCE FROM INCOME TAX STATISTICS," HITOTSUBASHI JOURNAL OF ECONOMICS, Volume: 56 Issue: 1 Pages: 1-19. ^ Giangiacomo Nardozzi, "The Italian" Economic Miracle". Rivista di storia economica (2003) 19$2 pp: 139-180, in English. ^ a b Sandle, Mark; Bacon, Edwin (2002). Brezhnev Reconsidered. Palgrave Macmillan. pp. 44–45. ISBN 978-0-333-79463-0. ^ Brown, Archie (2009). The Rise & Fall of Communism. Bodley Head. p. 403. ISBN 978-1-84595-067-5. ^ "1957: Britons 'have never had it so good'". BBC. 1957-07-20. Retrieved 2009-03-12. ^ Mark Easton (2006-05-02). "Britain's happiness in decline". BBC. Retrieved 2009-03-12. ^ Burton W. Folsom; Anita Folsom (2011). FDR Goes to War: How Expanded Executive Power, Spiraling National Debt, and Restricted Civil Liberties Shaped Wartime America. Simon and Schuster. p. 311. ^ James Ciment (2015). Postwar America: An Encyclopedia of Social, Political, Cultural, and Economic History. Routledge. p. 419.